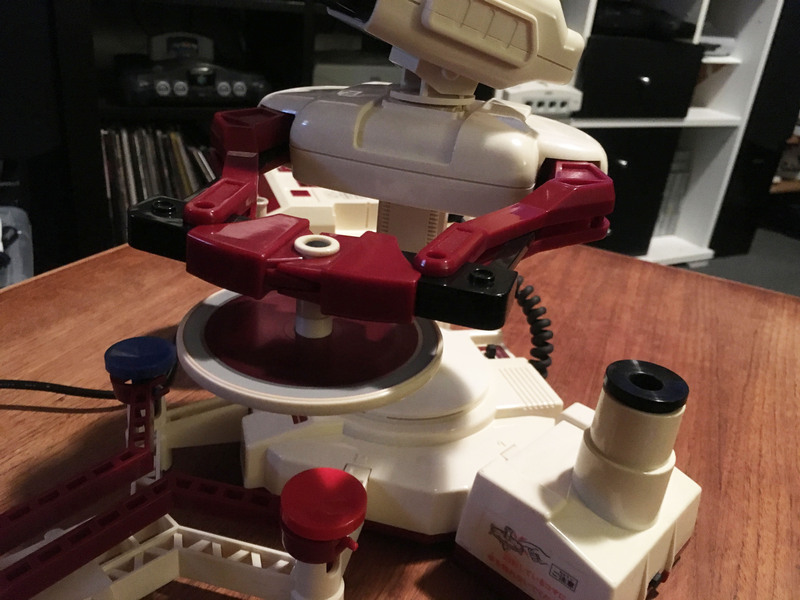 Family Computer Robot (ファミリーコンピュータ ロボット) – The Japanese R.O.B. – Nintendo Sega Japan! 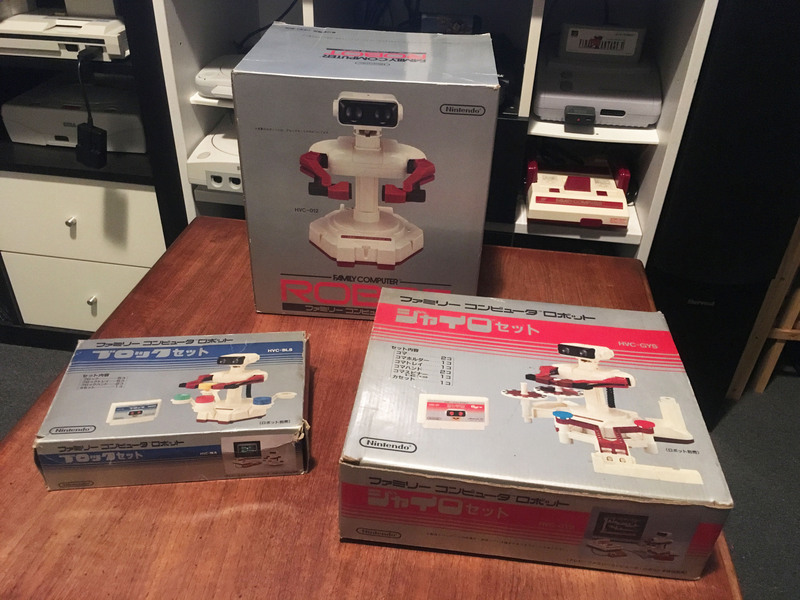 Family Computer Robot (ファミリーコンピュータ ロボット) – The Japanese R.O.B. 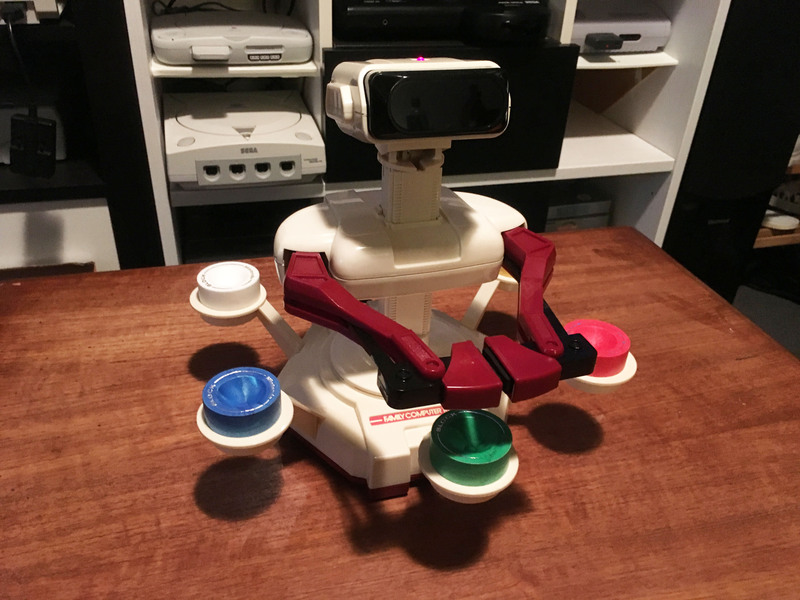 You’ve likely heard the story of R.O.B. 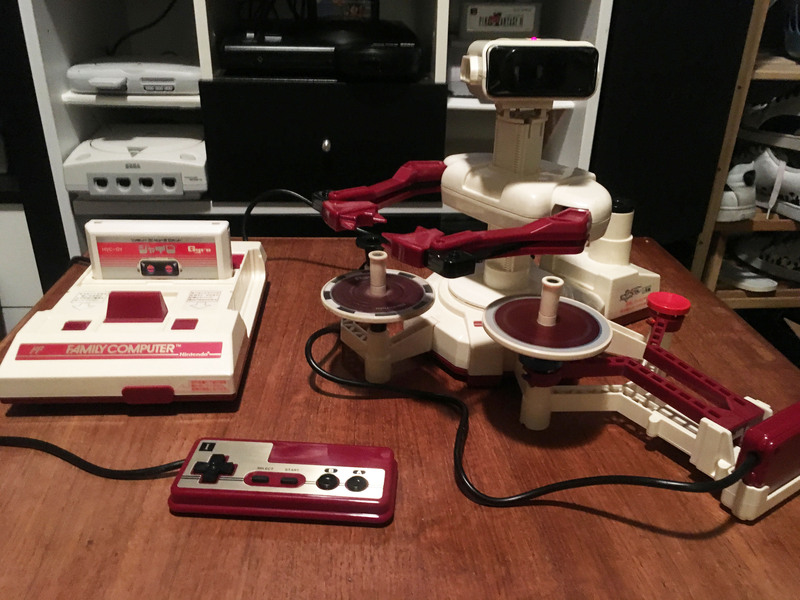 ‘The Robotic Operational Buddy’ for the NES. 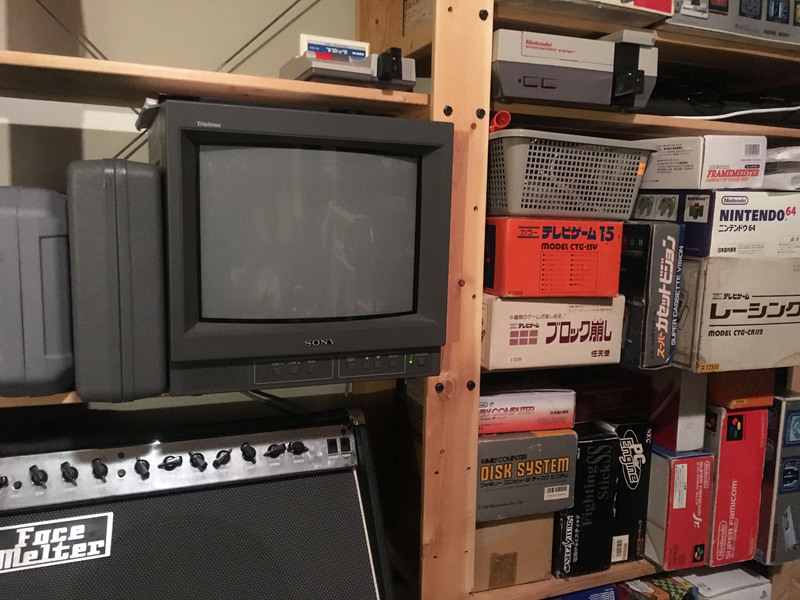 The story usually goes like this: when Nintendo wanted to bring their successful Family Computer console to America in 1985, the stores wouldn’t take it because they were afraid of losing money on video games, as there had just been a big video game market crash. 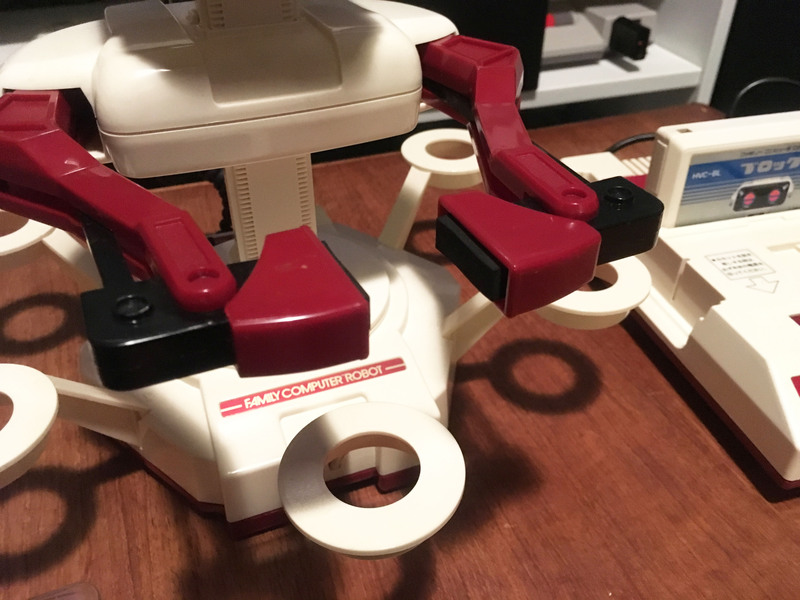 So in order to get toy stores to stock the console, Nintendo initially bundled the NES with a toy robot and marketed it as an electronic toy instead. 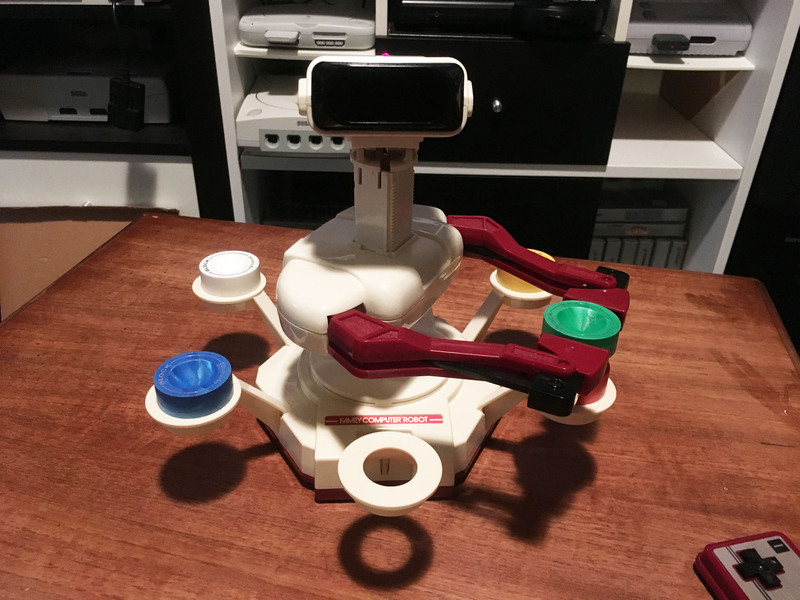 Some of the story might be true, but R.O.B. 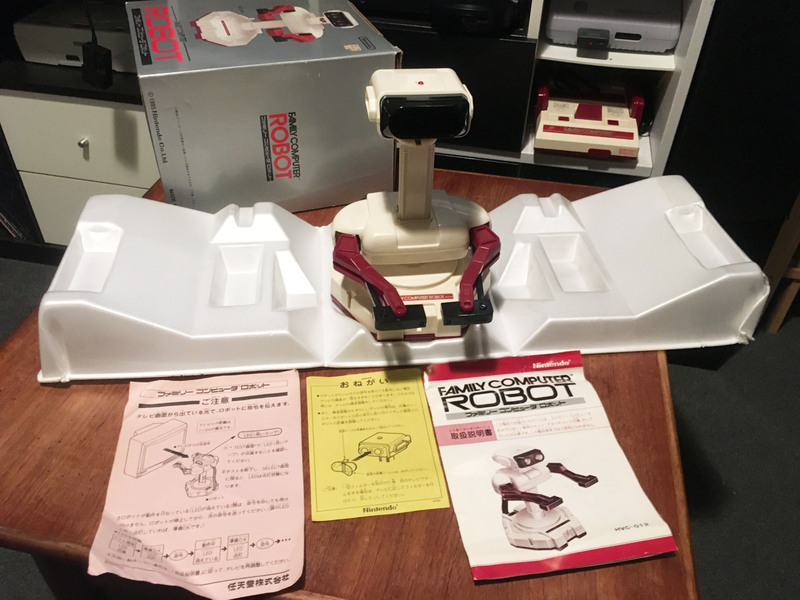 was actually released in Japan first, as the Family Computer Robot. 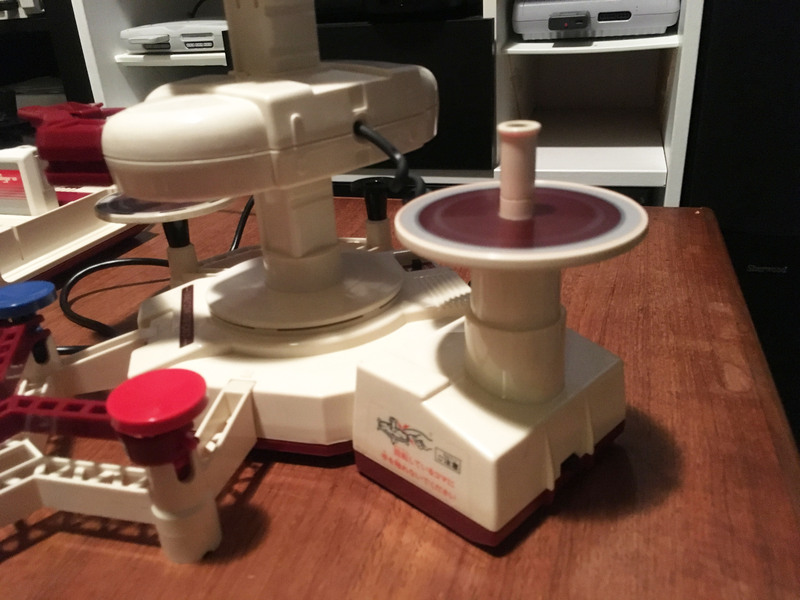 Nintendo was a toy company before they were a games company, and there were many existing examples of the company combining electronics and toys before this. 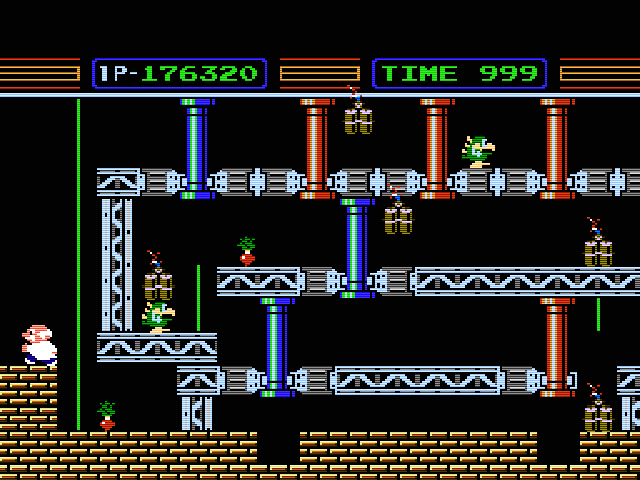 Among the most notable are the original electro-mechanical light gun games: at home (Electro Safari and Electro Bird) and in the arcade (the original versions of Wild Gunman and Duck Hunt). 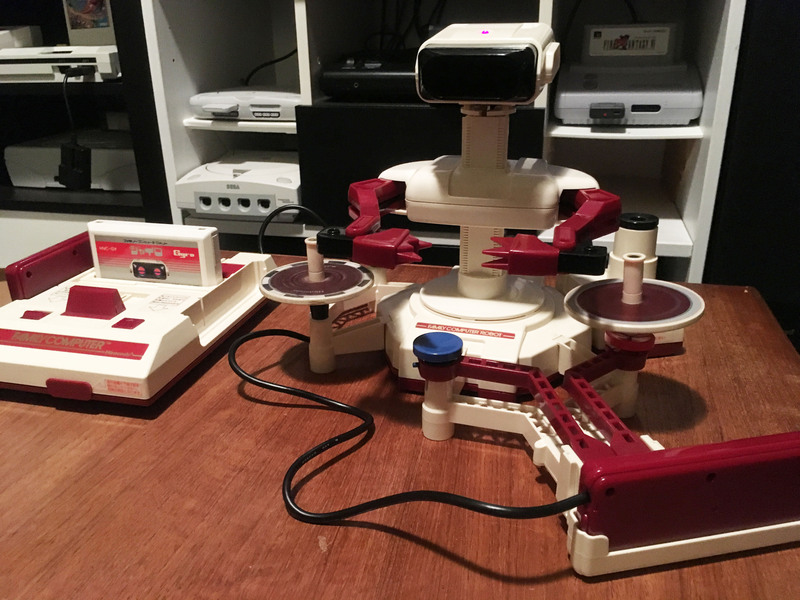 So really, the robot and its accessories were just part of a long toy/game continuum that continued throughout the Famicom era with peripherals like the Power Pad and all the way through to today with Amiibo and Labo. 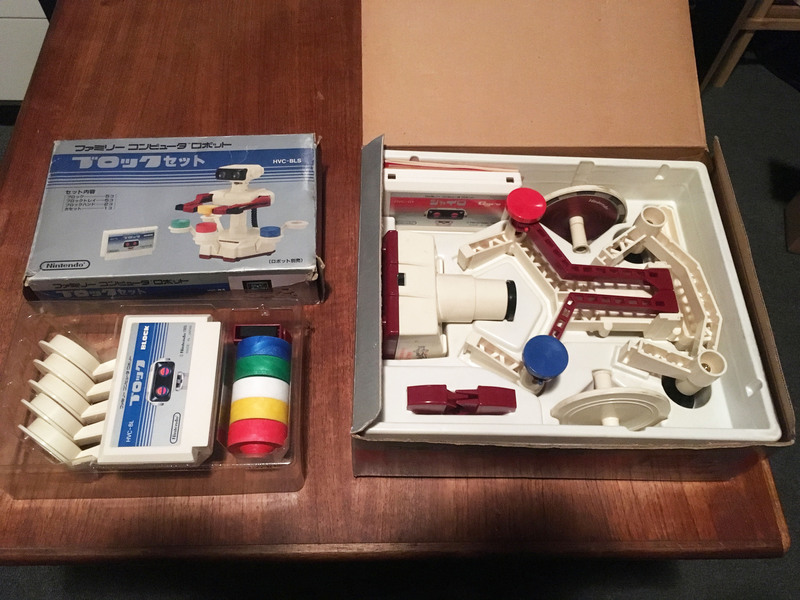 The games that were compatible each came with a veritable toybox of additional parts, and are essentially complex mechanical games that use the robot as a central item. 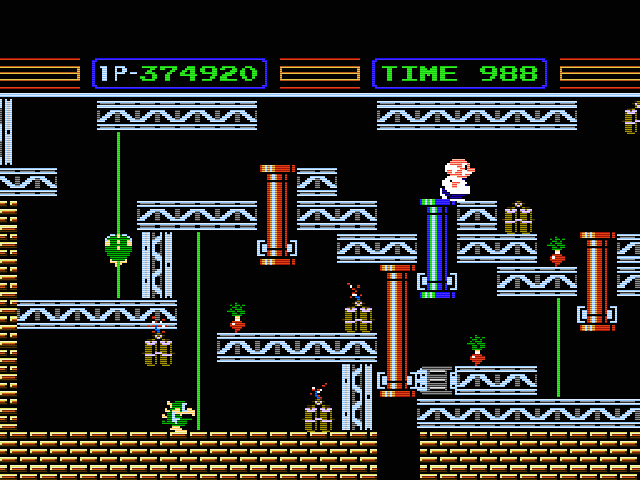 Only two games were released, Robot Block and the more elaborate Robot Gyro. 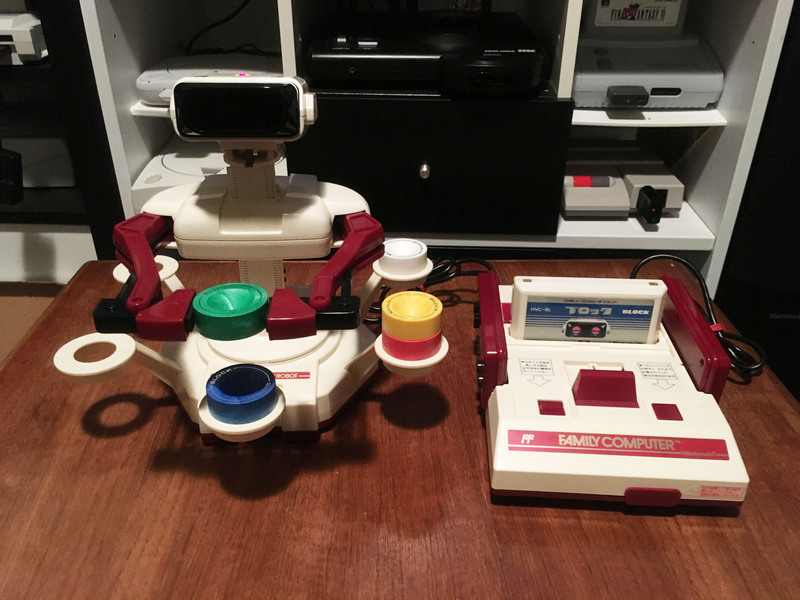 The Family Computer Robot uses pretty much identical technology to the light guns of the day, but in reverse, so instead of the screen responding to the peripheral, the peripheral responds to the screen. 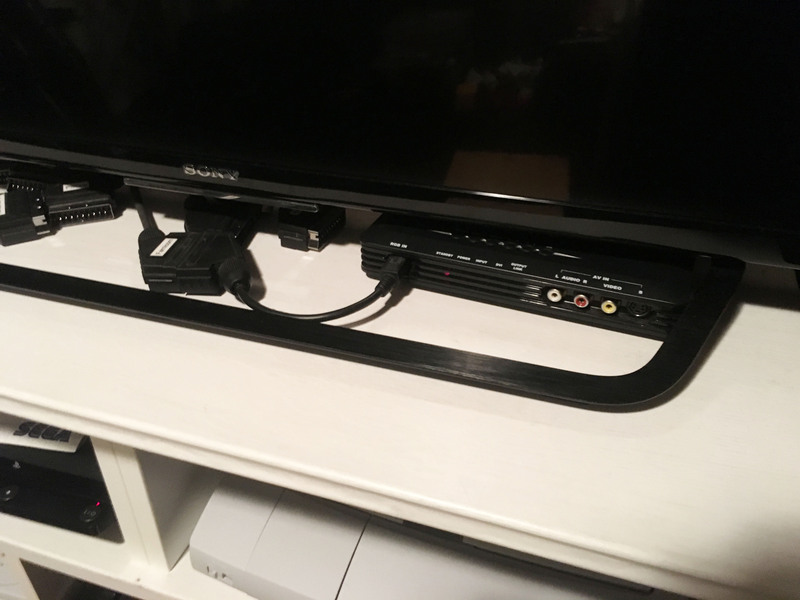 Like light guns it relies on the screen scanning display technique of a cathode ray tube, and so will not work on modern fixed pixel screens, even via a scaler. Sorry Framemeister, you’re not up to this task. So for robot games, a CRT is required, luckily I keep one on hand for just such an occasion. Essentially the robot needs to be positioned so he can see the screen clearly in order to respond to the commands he is sent. The robot can receive commands from the screen and execute a simple movements based on them. He can move his arms up and down, left to right, and can open and close his grip. This movement set allows him to pick up and move objects. The two games approach the concept of ‘robot which can pick up items’ differently. 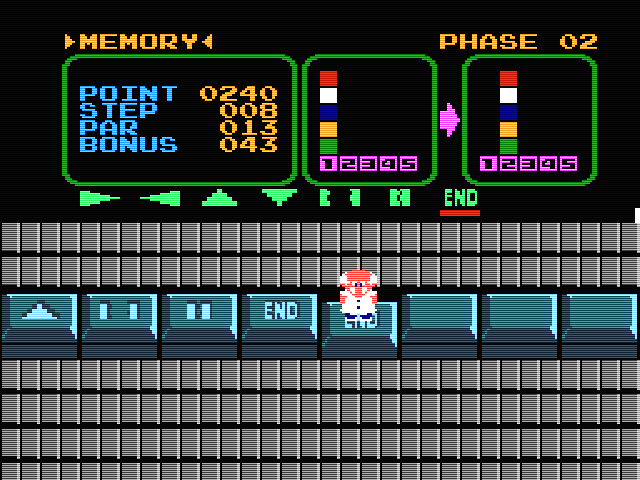 Robot Block primarily makes the physical element of the game the primary one, integrating the Famicom software into the mechanical game. 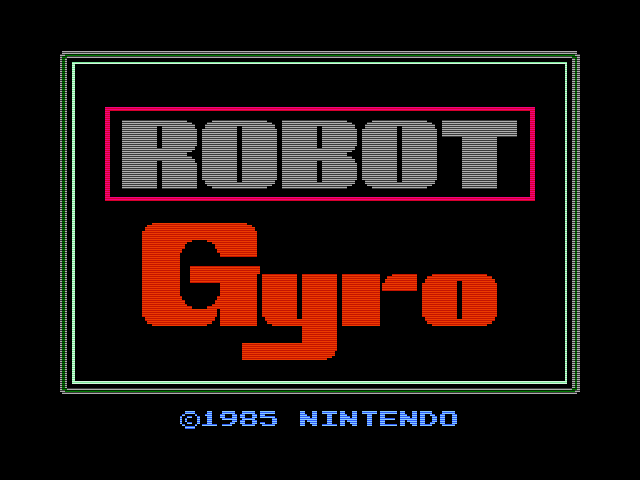 Robot Gyro is essentially a regular video game which includes the robot (and gyro) functionality as a physical gimmick. 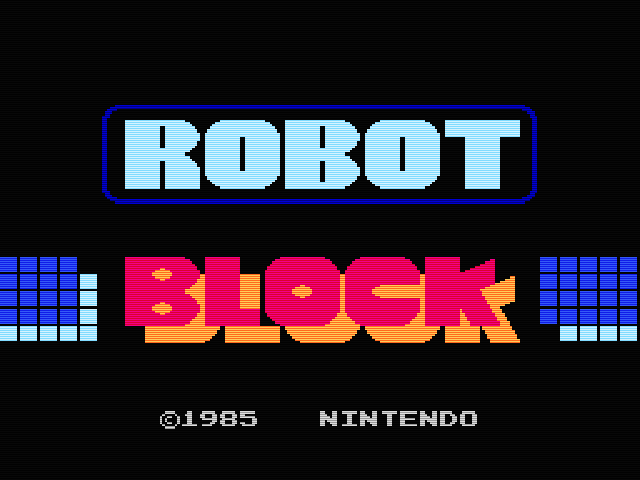 Robot Block is the simplest of the two games, in both set-up and software. 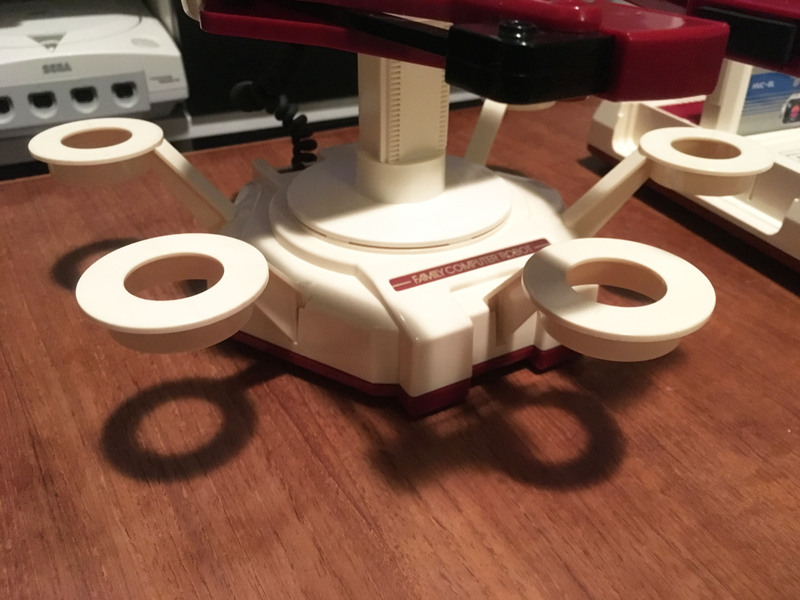 It comes with a series of attachments which are slotted into the robot’s base, some discs which sit in these attachments and can be stacked on each other, and some hand attachments which can grip the discs. The physical game involves manoeuvring the robot to pick up the discs and stack them in a particular order. 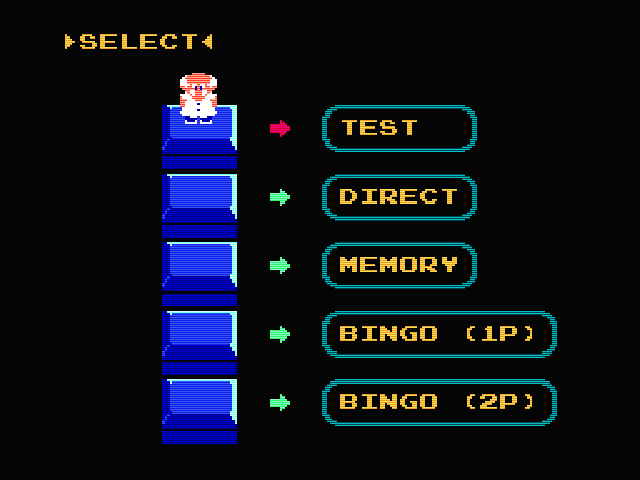 The game itself features a robot testing tool, and three game modes: Direct, Memory and Bingo. 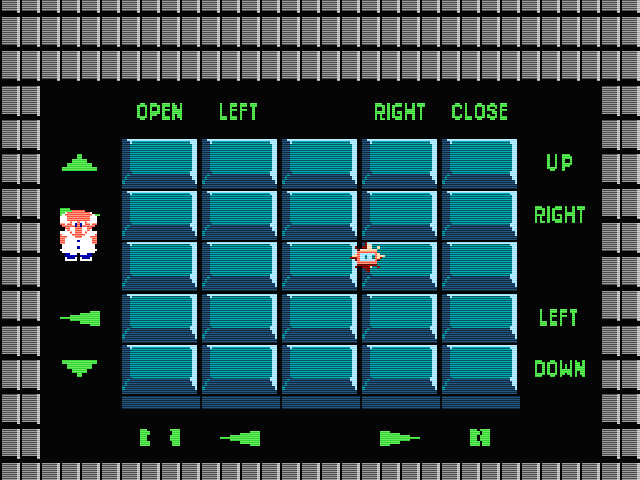 All the games involve a little professor jumping around the interface. Direct is the simplest, you have to stack up the discs in a certain order as shown on the screen. In Memory you must set up a series of moves for the robot to execute in order to achieve the required physical result. Bingo is a one or two player game where you have to fill in rows or columns in order to execute commands. Essentially the software is useless without the accessories, since it’s really just a tool that is used to play with the robot and pieces. It’s also not very fun beyond the 80s robot novelty. Robot Gyro is both the better game, and has the better toys. It also has a much more elaborate set-up. 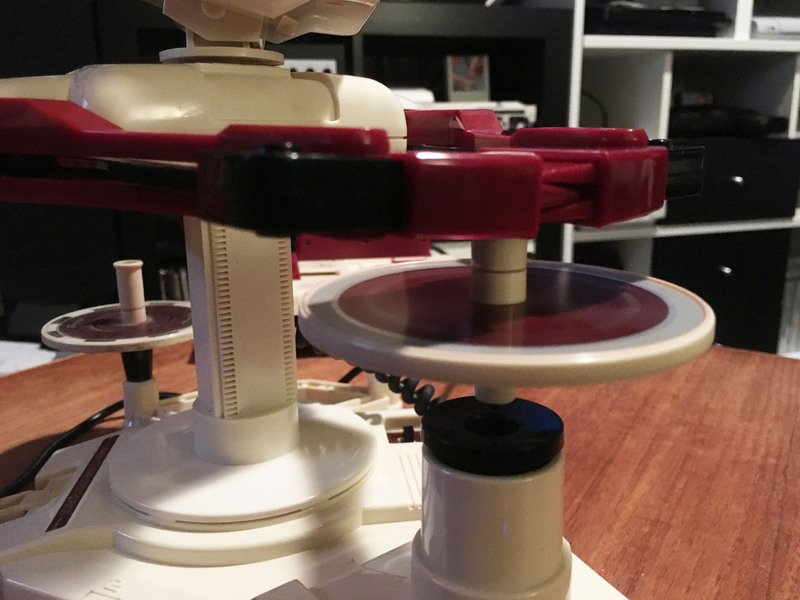 First of all there is a bracket on which the Famicom player II controller sits, with a levered mechanism which can hit the A and B buttons. 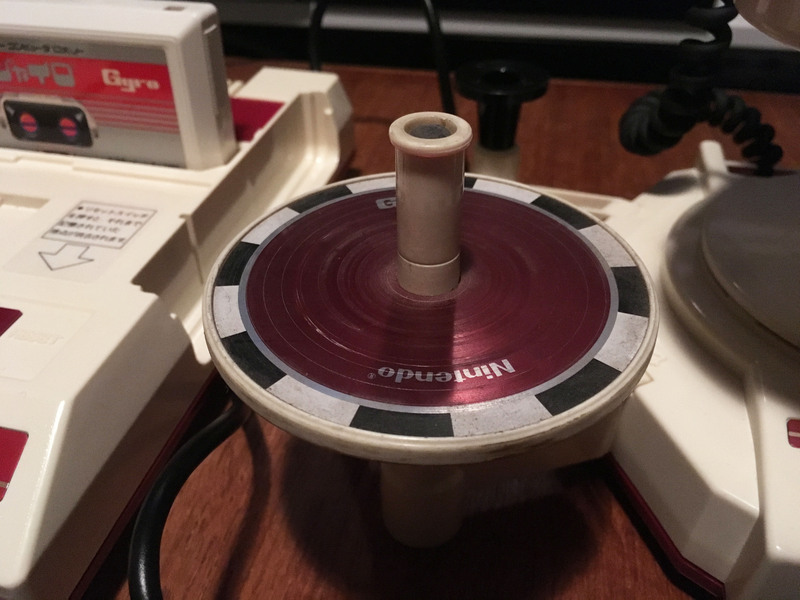 There is a powered gyro spinner which gets two tops spinning at high speed. 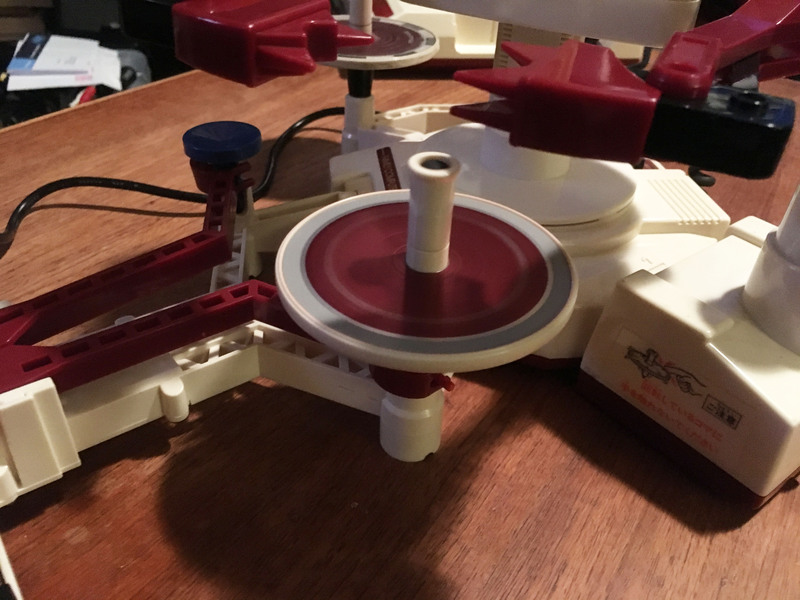 …and release, which presses down on the matching button on the controller. There’s also a slot over on the right to keep the second top when not in use. Here’s a closer look at the mechanism to hit the buttons. 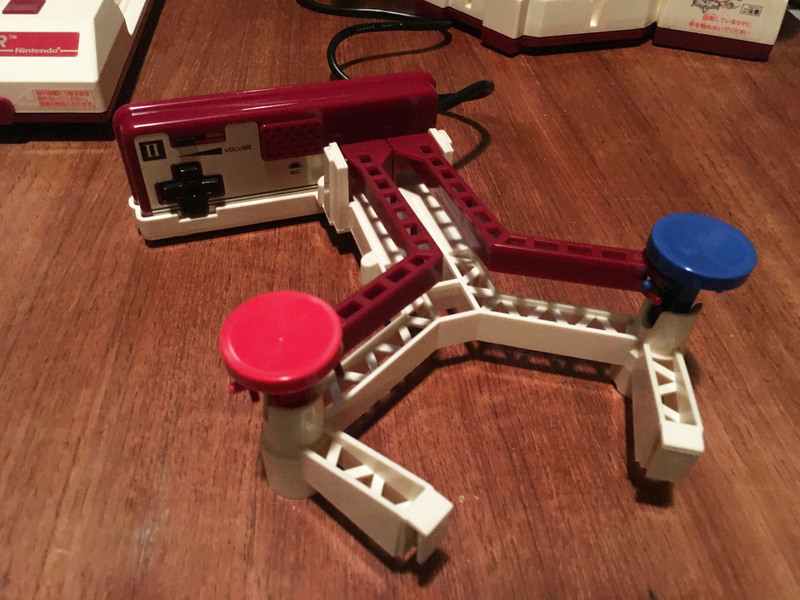 The mechanisms are coded in blue and red, which ties into the game. The set up is actually a pretty fun toy in and of itself, due to the spinning tops being pretty fun and the whole set-up being nicely done. But what about the game? 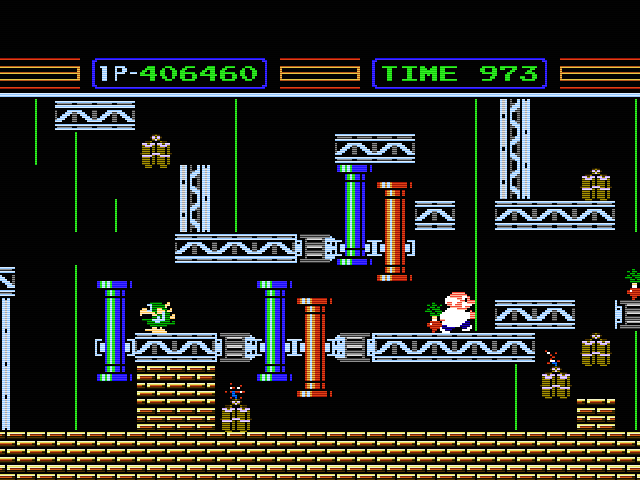 Well it’s a pretty standard 80s puzzle action platformer (think Lode Runner or Crazy Castle), where the same professor character from Robot Block has to collect all the dynamite in the stage while avoiding the critters. 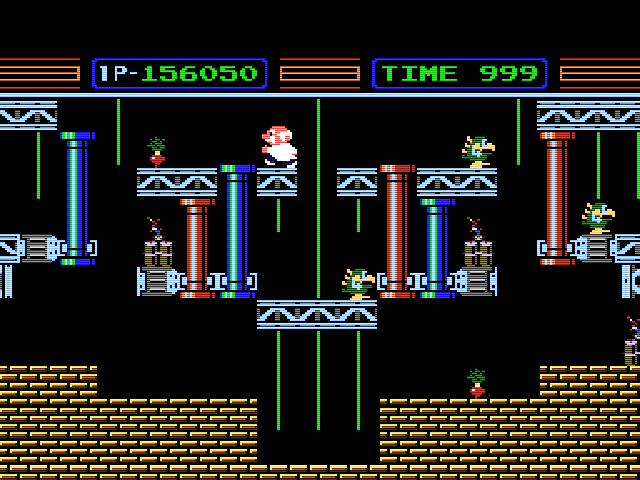 The gimmick is that the stages are full of red and blue pipes which move up and down when the red and blue switches have been hit. In order to get the robot to do this, you essentially pause and issue instructions. It can often take several moves for the robot to slowly get the top to the right button. Actually playing with the robot is tedious, but the game itself is a decent puzzler if played without it in two player (with the other player hitting A and B). So while the robot toys are fun to play with, and the game is decent, together they are less than the sum of the parts. 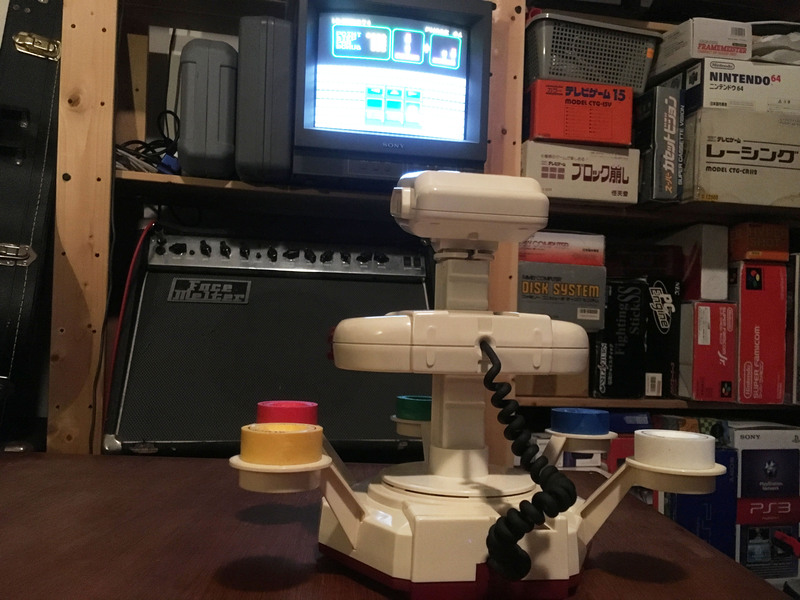 Overall, while not being the most fun games to play on the Famicom, the Family Computer Robot games are fun pieces connecting Nintendo’s toy and video game eras.